In today's world, individuality and personalization are the keys to success in the retail industry. UNIQLO believes that individuals should have their own unique style, which is why they design quality clothes that are both simple and casual. UNIQLO customers can be themselves anytime, anywhere, and any place. Although UNIQLO's clothing gives their customers the flexibility to mix and match styles and brands, they do not carry that individuality into their physical or digital shopping experiences. For the past 100 years, retailers have only catered to one type of shopping style, browsing. 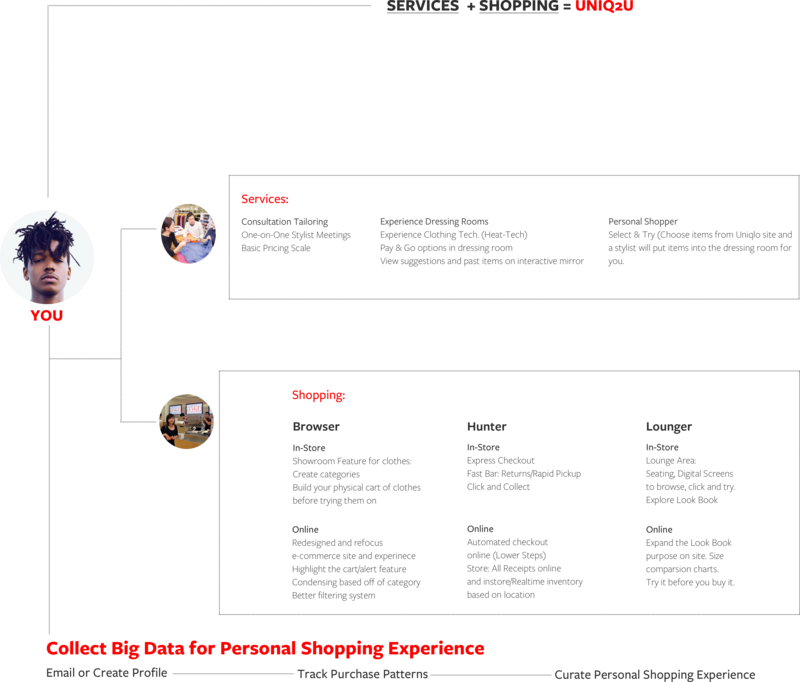 How can UNIQLO change that trend and create personalize experiences for their customers? Create a new business model that creates an ideal shopping experience for every type of shopper. These two areas are the sweet spots for UNIQLO. Expanding these two areas will create more opportunity for them, as a company and for their customers. UNIQ2U provides more options to shop, within any platform, any space, and at any given time. Taking the best features of the digital shopping experience and integrating it into the in-store experience. UNIQLO Shoppers are trendsetters in their own right. We created three shopper profiles and developed personalized experiences for each. Giving them the same flexibility that UNIQLO's clothing provides. UNIQLO's offers a few services currently. We expanded their existing services, as well as added new ones, in order to meet the needs of their customers. UNIQLO website is now for all types of shoppers. From begin able to shop through looks, easy and quick check-out, and browsing for clothes through an easier and user friendly interface. Rei Inamoto of Inamoto & Co. tasked us with this challenge. The hope that Uniqlo can transform the way we shop within every aspect with this business model.